Describing Trump’s televised speech on Tuesday about the situation on the US-Mexico border as a “TV stunt”, Clinton urged her audience to “keep counteracting his lies about migrants and refugees with positive action”, though many users opted to criticise Hillary instead of heeding her advice. — Andrejs Eglitis (@falconnestorg) 9 января 2019 г. The great thing is your posts are getting more and more unhinged as the days wear on. 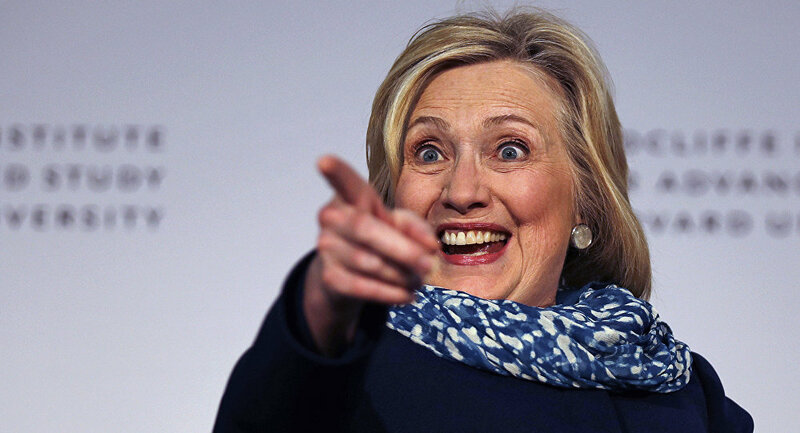 You can't accept the FACT that you were an unlikable, corrupt candidate who had to be thrown into vans by the FBI because you can't stand up for too long and you LOST the election. — PornOh2 (@Oh2Porn) 9 января 2019 г. — Coinor McGregor (@ConArtist111) 9 января 2019 г. — KrisiAnn (@krisiannc) 9 января 2019 г. Several people were quick to point out that merely a few years ago, Hillary herself apparently advocated doing the same thing she now criticises Trump for. If what he says are lies, how come you were saying the exact same thing just a few years ago? — DaveFromColorado (@dave_pitsch) 9 января 2019 г. — Buzzsaw (@M_R_Sumbigguns) 9 января 2019 г. Others questioned the sources of the former Democratic presidential nominee’s personal wealth, bringing forth allegations of embezzlement and corruption. Take down the wall around your mansion, BTW how did u get that much money to build that mansion with walls around it? — Dan Graf (@dan_graf10) 9 января 2019 г. Why you’ll just KEEP the money like you did for Haiti! — walker1oh (@walker1oh) 9 января 2019 г.
Haiti? Stop stealing people’s money in the guise of charity. — odoyle_rules (@r_thrift4) 9 января 2019 г. Earlier, US President Donald Trump addressed the nation from the Oval Office, describing the situation at the United States’ southern border as a "humanitarian crisis, a crisis of the heart and a crisis of the soul". He also called to secure the funds necessary to build his long-promised wall along the border with Mexico, and blamed the Democrats for the current government shutdown.